The fragile bond between mothers and daughters is very much a thematic concern in the arts at the moment, with Greta Gerwig’s film Lady Bird out on general release, Craig Gillespie’s I, Tonya hot on its heels, and Monica Dolan’s critically-acclaimed monologue The B*easts making a return to the stage after a successful run at the Edinburgh Festival last year. Continuing in this vein is Lorna Martin’s debut play for A Play, A Pie and A Pint’s spring season in Glasgow. And what an assured, wonderful debut it is, directed with great verve and insight by Maggie Kinloch. Sally Reid’s Leanne initially seems a tad snobbish, the kind of woman whose conspicuous consumption is outweighed by her slightly self-aggrandizing assertion that she is the picture of empathy and taste. Her amateur psychology amuses, just as it is wincingly recognisable in so many parents, living vicariously through their darlings. Scratch that veneer, though, and a Katie Hopkins emerges – an insidious woman with a vice-like grip on her family and a steely eyed gaze that never wavers from her precious, longed-for daughter, Nina. “She’s admired in Waitrose… look at those curls… just like Shirley Temple,” she purrs. Leanne and hubby Craig have even moved to be closer to the school, just as a precautionary step. But now, it seems, her little Nina hasn’t been invited to popular kid Bo’s party. Bo’s mother Catherine is a children’s author, and Leanne will stop at absolutely nothing to ensure her Nina can go. Lying, wining and dining the mums from “that area”, and worse. 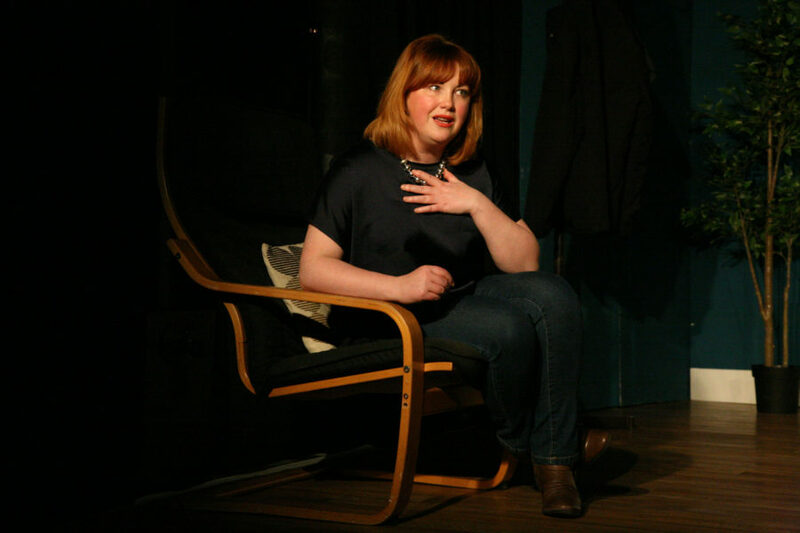 It becomes horribly clear in this bruised, beautiful and savage script that Leanne may just be projecting, acting out some past hurts that never left her. Yet, to what end? She’s an immensely complex character, a layered creation who elicits sympathy as well as pity, and ultimately disgust at the lengths she to which she will go. Reid is incredible from the off: a rich, expressive actor who can vacillate between lost, hurt child and swaggering adult from minute to minute. She’s all darting eyes and manic energy, prowling the room in between gulps of water from the cooler. Ultimately, Martin’s script asks wider questions of societal roles. Why do some children get everything, while poorer families are judged and excluded? Why can’t some mothers just let go of their ascribed roles? And how did we get from jelly and ice cream to bouncy castles, children’s entertainers and drinks and canapes for the adults? Pester power may be as ubiquitous these days as the school prom and other American institutions finding their way to the UK, but surely buying into it can be as damaging as never letting go. And as the last terrible step is taken to ensure little Nina gets to the party, gasps of shock mingle with ribald laughter in the audience. A striking piece from an impressive new voice. Party Politics is at Òran Mór, Glasgow, until February 24th. For more details, click here.